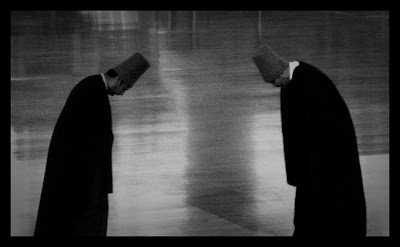 If you are possessed of discernment, joined with knowledge - seek the company of the dervishes and become one with them. Love for the dervishes is the key which opens the door into Paradise. The dervish's garment is nothing but a patched robe, and he is not led astray by earthly desires and passions. - Fariduddin Attar. Jesus Christ in the Beatitudes identified blessed ones as poor in spirit and meek, which basically is a precise archetypal description of sufi dervishes. During the time of the Prophet Muhammad, there were poor, wandering companions and lover of God who used to live at and near the Prophet's mosque. They were called Ahl e Suffa or People of the Shed / Porch, because to attain gnosis directly from the Prophet, they used to be found at the porch of the mosque most of the time. Although the very term 'dervish' or 'sufi' were not used during the time of the Prophet, but in spirit Ahl e Suffa were the dervishes who had nothing and wanted nothing but God. That is the hallmark of a sufi who wishes nothing but God. Some scholars gives credit to the term 'Ahl e Suffa' to be source of the word 'sufi'. According to historians "Al-Suffa" was the first Islamic School in the history of Islam. Its teacher was no other than beloved Prophet Muhammad. Its students, Ashab (Ahl) Suffa were known to have given up worldly desires and were in a perpetual state of learning their deen (path of journey to God). This school was in our beloved Prophet's masjid in Medina. The Persian word dervish (or darwish, darvish) is one who sits at the door (literal meaning is sill of the door). Spiritually it means one who sits at the door between this world and the next, who is at the door step of visible and invisible. Initiated sufis are also called dervish, meaning one who is at the door of enlightenment. The word Dervish generally refers to members of Sufi Tarika (order), known for their poverty and austerity, similar to mendicant friars. Also refers to a mendicant ascetic. Among the blessed companions of the Holy Prophet, Abu Bakr and Ali are identified as the first dervishes according to their spiritual attitude, ascetic personality and lifestyle. In the 18th Chapter of the Quran (Al-Kahf, the Cave) , the blessed Prophet Muhammad is told to be content with the people of remembrance and who are seekers of God. It addresses the Prophet and at the same time advices humanity in universal sense to seek gnosis (the highest knowledge, knowledge of Self) from people who are seekers and have ceaseless remembrance of Beloved, the Most High in their heart. Fariduddin Attar's quote as mentioned in the beginning of this post in a way mirrors the above Quranic passage: to be content with these special group or category of people, to befriend them who are seekers of Beloved God. The above passage of the Quran also sets criteria who should NOT be followed or accepted as a spiritual guide or teacher. It advices not to obey / follow anyone who neglect the remembrance of God but follow their own desire, hence crosses limits. In our interesting time numerous so called new age spiritual teachers and self labeled masters can be found; unfortunately some of them end up creating cult around them and instead of pointing to the One Divine Source, they focus all attention upon themselves, upon their own ego. Offcourse there are sincere spiritual teachers who have adopted new age language for teaching, but one needs special attention and attunement to be able to recognize such teachers. Mere camouflaged nice words and lip service shouldn't and couldn't be signposts for recognition. This particular verse of the Quran thus acts like an acid-test which can be used when choosing a spiritual master or guide. The main criteria being: one who doesn't neglect the Divine remembrance and one who doesn't follow their own ego or desire but are aligned with Divine Will is the one who has the primary qualification as a spiritual teacher. For an individual to become a spiritual teacher, it takes tremendous inner-work, self discipline and mastery upon oneself to arrive at that station where the ego of the individual is annihilated to make room for the Divine.